The summer season is a great time to enjoy the great outdoors in Port Alberni, BC and the experts at Van Isle Ford are here to help you find the best options to enjoy a gorgeous location along with the perfect Ford vehicle to make a week or weekend camping in the great outdoors the best ever. If you are after an untouched fishing hole, the serenity of the deep woods or just a thrifty staycation, then set your GPS to one of these campsites in British Columbia. For those who enjoy peaceful and scenic riverside camp-sites as well a touch of the farm life, should consider a camping trip at Arrowvale Campground. This campground, which is located just a few miles from your Port Alberni, BC Ford dealer, offers acres of serene farmland and as well as camp sites along the pristine Somass River. Kids are even sure to enjoy the centralized petting farm. Vancouver Island’s best kept secret, located on the Alberni Inlet, just 10 km from Port Alberni, offers summer camping with 250 full and partial service tent and RV sites with forest or beach views. For those with a family full of children who love playing outside, are sure to enjoy climbing into a Ford Explorer and heading to this gorgeous camping location in British Columbia. Situated in Port Alberni, 33 km from Parksville Timberlodge Campground offers some of the most luxurious RV/camper camping available in British Columbia. 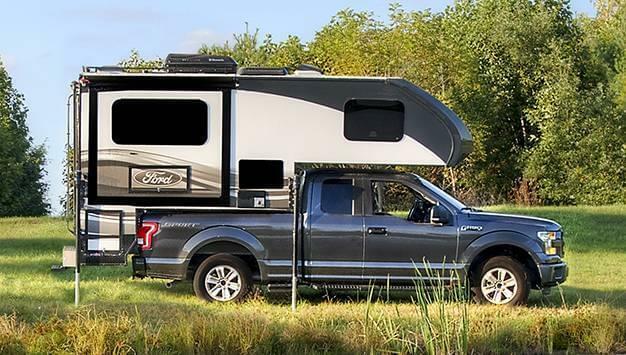 So, get your Ford F-150 and camper ready and head to this spacious campground with an onsite restaurant, free Wi-Fi, hiking and even an onsite garden. For those who are on a budget and prefer a bit of free fun in the great outdoors then we also have a few out of the way campgrounds that will help you leave the stress of outside world behind. Open year round, the free campsites at Arden Creek are virtually undiscovered by most campsite campers. Offering two walk-in pads and four vehicle pads that allow you to camp along the shore, as well as discover fascinating wildlife all while enjoying some one of a kind fishing or windsurfing. Due to being a bit out of the way, you will need a vehicle that can handle a bit of off-road driving, like the Ford Edge. Another well-kept secret in out of the way camping in British Columbia is located at Toquart Bay. This free campground offers some of the best kayaking available in this area. To get to this free, but beautiful campsite you will need a vehicle that can take a beating, but still get you where you want to be. So, your best vehicle choices for this trip will obviously be a Ford F-150 or Explorer. Located at the bottom of a long dirt road this public campground offers beautiful and serene views of Nahmint Lake as well as fishing, hiking, swimming, wildlife viewing and even excursions with your furry loved ones. Each free campsite also offers a fire-ring and a picnic table and there are also on-site restrooms. No matter which location you choose or which trip you decide to take this summer, Van Isle Ford is here to help you find the perfect Ford vehicle no matter where you may roam. So, don’t miss out on enjoying the time of your life with the wrong vehicle.